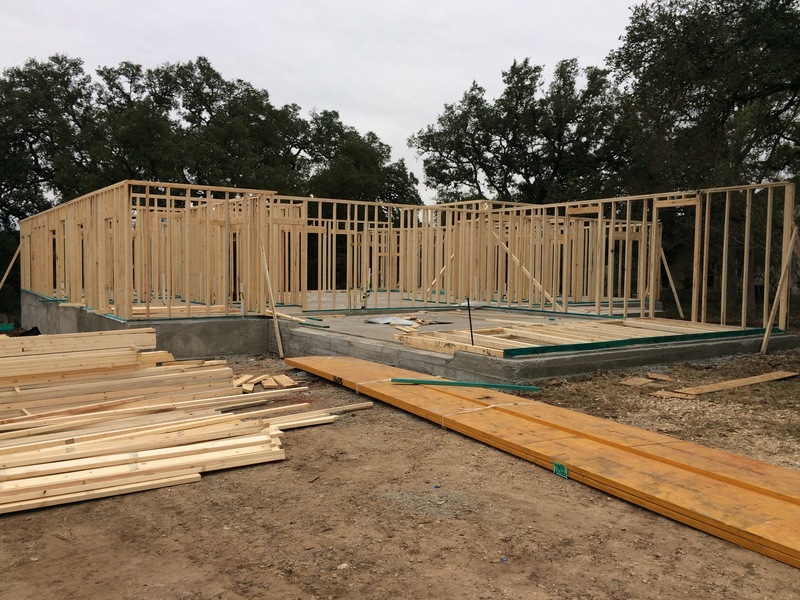 Building Oak Haven – framing! It’s been a busy week. Full of ups and downs. The ups have been the house. 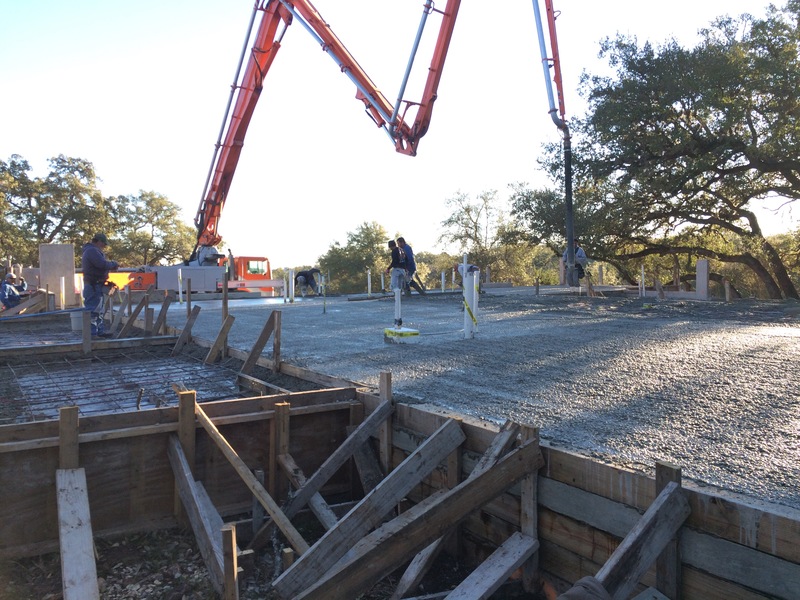 Monday, Fortress Concrete poured the slab, a fascinating process. The concrete truck showed up before sunrise. We didn’t show up quite that early and by the time we arrived, 3/4ths of the foundation of the house was finished. The trucks transferred concrete into a huge piece of equipment with a long crane-like arm and a hose at the end. One of the men had a remote control and positioned the arm while another maneuvered the hose and blew concrete into sections of the foundation. A third man had a pole he used to ensure concrete made it into every spot needed and, I assumed, took care of any air pockets. Another man had a long squeegee and smoothed out the top of the concrete. 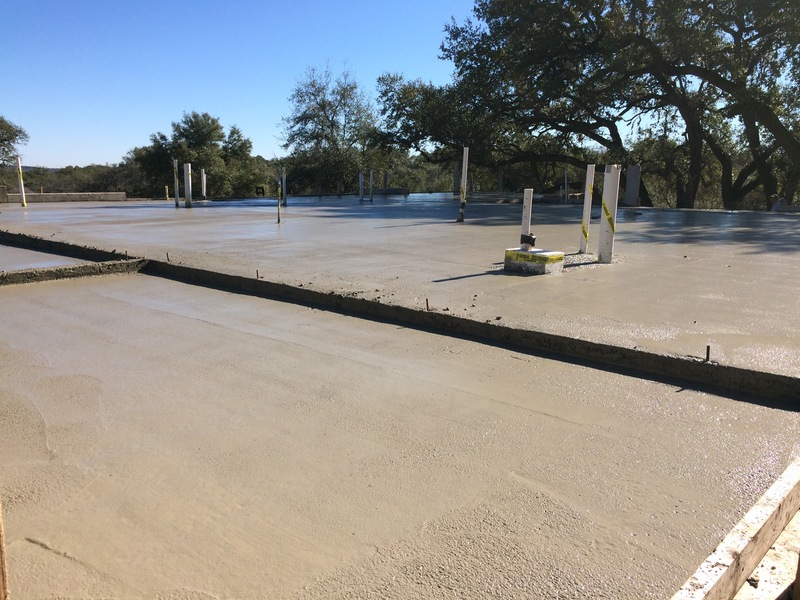 When all the concrete was poured, they had a machine to polish the house floor and a brush to provide a texture in the garage porch and patio. A couple of men also shaped the back steps, one step at a time. The next day, the forms were dismantled and taken away. I’m told that Fortress will come back and make the exterior foundation walls look pretty with patching and smoothing. Thank you Luis and Fortress Concrete. You’ve done an amazing job. 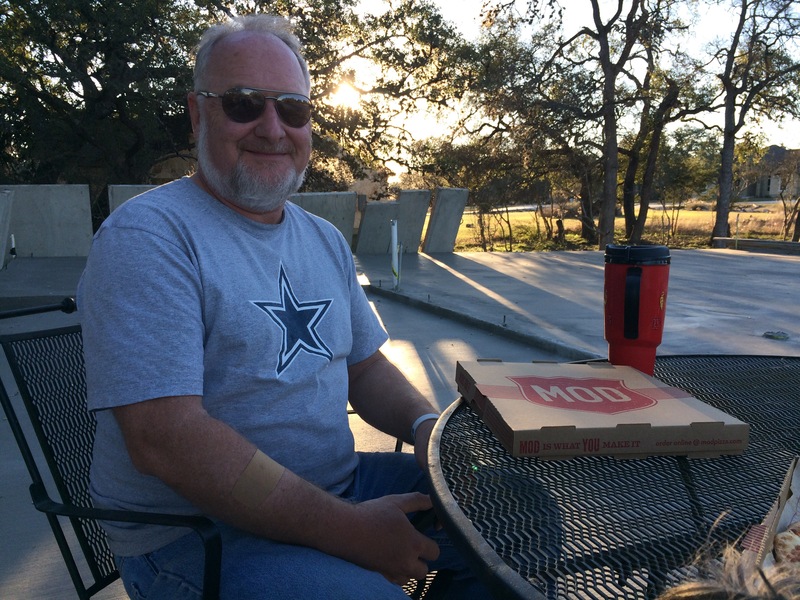 That evening, Jon and I carried on the tradition our family has of having pizza for dinner on the first night in our new home (we’ve had many). A slight variation, of course, since we have a ways to go. But it was lovely on the back patio. While we were watching the foundation being poured I decided to give my parents a call. They were both feeling under the weather over the weekend and I wanted to check on them. Then came the down (of the ups and downs). Dad had called the ambulance. Mom was admitted to the hospital for the third time this year. By the end of the day, she was back on the ventinlator. It has not been a good week for her, or us. She hasn’t been able to tolerate breathing on her own for very long, except one promising two and a half hours on Thursday. From what I understand, the doctors think her lungs are starting to give out. She’s been on oxygen for over two years and I’ve lost count how many times she’s been on the ventilator. This is the fourth time in seven months. In July we were faced with the possibility of having the doctors do a tracheostomy for the ventilator. Thankfully, she was able to be extubated the next day. We are once again faced with the same decision. While I struggled with the down, we had another up on Wednesday. Our first load of lumber was delivered. As well as our dumster. The framing started that morning and has been going quick. By evening, most of the walls had been erected. Another interesting process. The framers drew the outline of every wall then marked on the concrete every window and door size, along with header height. We were able to verify some changes we made and check locations and specifications. 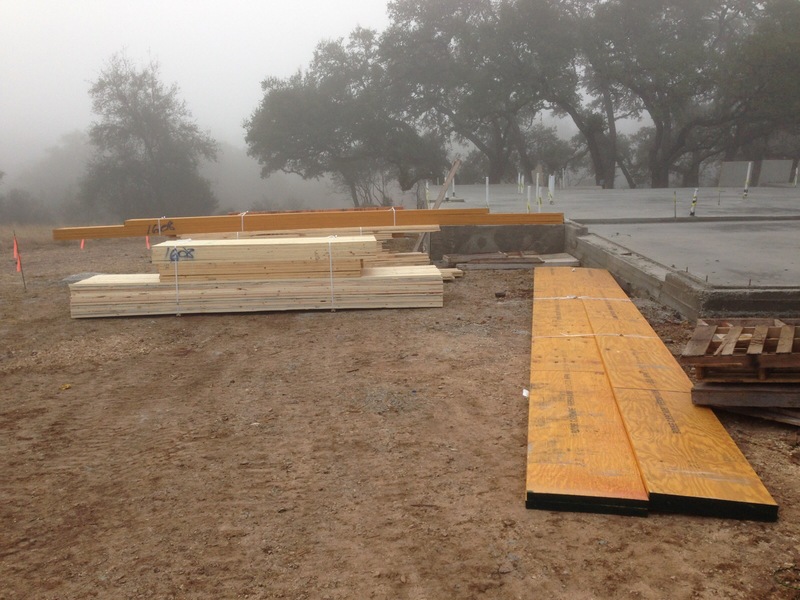 On Friday, the second load was delivered and the framers started on the garage ceiling joists. We decided to set up the camper in our front yard and spend the night. We had a lot invested in the piles of lumber stacked on our construction driveway. It was a bit challenging, but we finally positioned the camper between the front oaks in the front yard and the dumster (a very nice view). We’ve spent a lot of time in our camper and I know in the coming days, we’ll spend much more. My excitement over the progress of our new home is of course overshadowed by my mom’s condition. It’s been a tough couple of years for her. I know she’s tired and her lungs are tired. But she’s also a fighter. And we love her very much. God’s timing isn’t always what we would have chosen. I am trying to trust Him for wisdom, guidance and grace in the midst of it all. 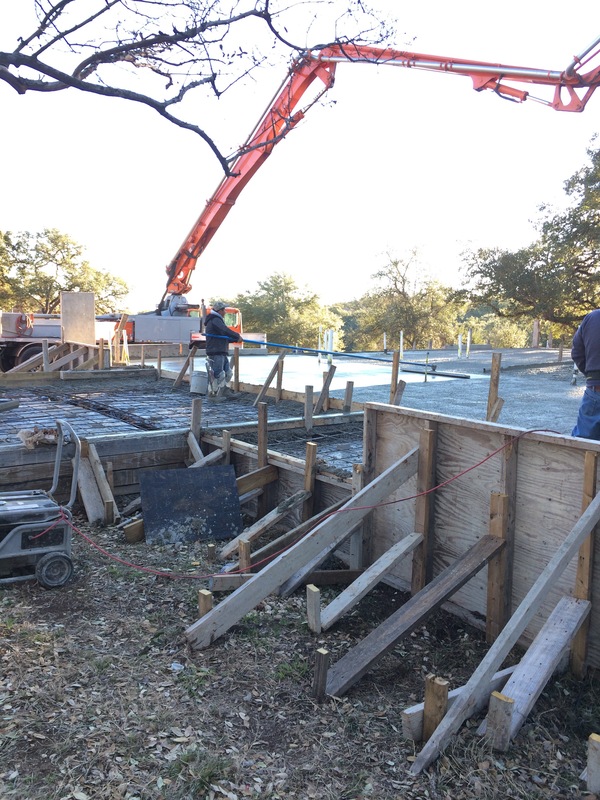 This entry was posted in Hill Country Living and tagged Country Living, Fortress Concrete, foundation, Framing, River Chase, Texas Hill Country, UBuild It. Bookmark the permalink.